Drab curtains and Muzak begone! We’ve found 10 hotels that turn convention inside out. Ready for a bed that seems to hover in the air? How about a night in a crane that you can pilot yourself? Turns out, it’s all possible with these surprising sleeps around the world. Soaring like an eagle may still be technically impossible, but at Treebones Resort in Big Sur, California, you can at least sleep like one. The resort is known best for its cliff-top yurts, but it also offers a single, artist-created, woven-wood nest big enough for two. 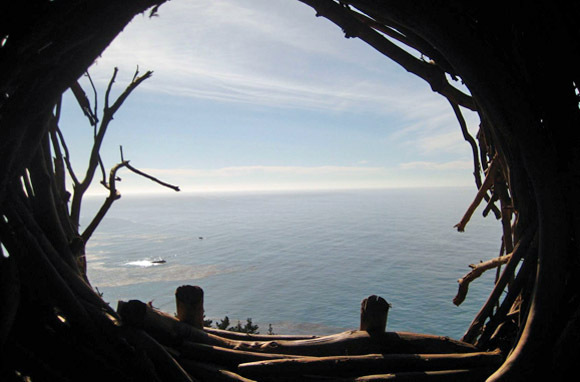 The roost overlooking the Pacific is padded with a futon mattress, but you'll need to haul your own sleeping bags and pillows up the ladder to make your perch cozy. The nest is part of a campsite that includes a picnic table and access to a water spigot. The nightly campsite rate is $95, and there's a two-night minimum. On Smarter Travel's sister site, TripAdvisor, Treebones Resort has a score of four out of five. 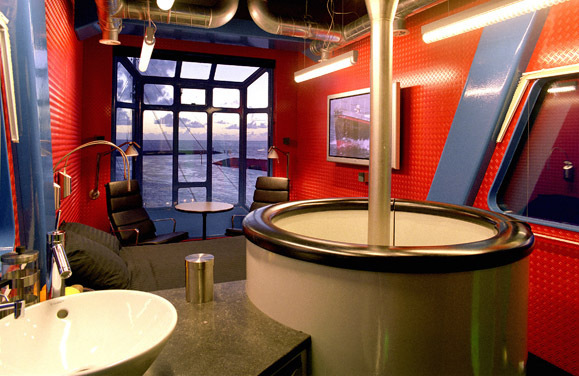 In Harlingen, Netherlands, your penthouse awaits. This exclusive, one-room hotel has its own private elevators because, well, it's a crane. Inside the Harlingen Harbour Crane, the small cabin has been outfitted with all the creature comforts you'll need for a night in the air. And if you follow the staircase from the main room to the cabin, you can take a seat in the control room and turn the 71-ton crane in whatever direction you choose. There's also a roof patio for surveying the scenery below. If you prefer a less soaring view, you can stay at the harbor's lighthouse. Or, earn your sea legs by spending the night in the decommissioned Harlingen Lifeboat. Per-night rates for nonholiday stays at the crane and the lighthouse are about $420, or about $301 for the lifeboat. On TripAdvisor, the Harlingen Harbour Crane has a score of four out of five. On 113 acres in Connecticut's Litchfield Hills, Winvian offers unusual luxury digs for playful spirits. Each of the 18 freestanding cottages offers a chance to immerse yourself in a unique and impeccably decorated world, from the mystical Greco-Egyptian-style secret society house to the camping cottage, with its views of the sky and indoor and outdoor fireplaces. You don't have to stop there, though: Indulge your inner child at the tree house, explore your animal side by sleeping in the beaver den, or fly high without leaving the ground in the helicopter cottage. The cottages may be whimsical, but the price isn't: Rates start at $650 per night for double occupancy with full breakfast. All-inclusive rates—which include full breakfast, lunch, picnics, afternoon tea, dinner, after-dinner sweets, all drinks, and unlimited use of amenities—start at $1,250 per night. On TripAdvisor Winvian has a score of four-and-a-half circles out of five. Have a hard time sleeping on planes? Jumbo Stay might be just the fix. The 747 that once flew for Singapore Airlines and Pan Am now makes its home as a hotel/hostel at the entrance to Stockholm's Arlanda Airport. The stationary plane is outfitted with a bar, cafe, private rooms, dorm rooms, and even a luxury suite in the cockpit. And the left-wing observation deck, open in summer, offers visitors the chance to stand on a jumbo-jet's wing. 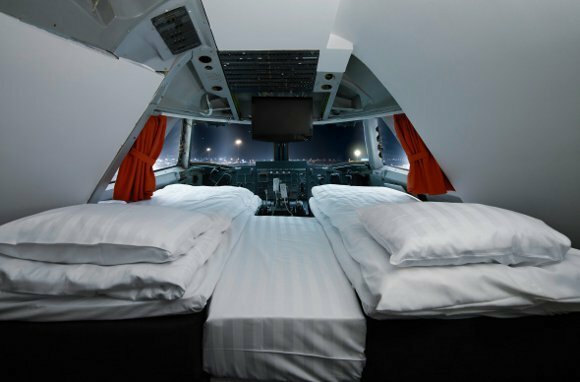 This is definitely the cheapest way you'll ever experience lie-flat beds on a plane. Per-night prices with breakfast range from $58 for a dorm bed to $580 for the cockpit suite. You can also pair a Jumbo Stay with other quirky lodgings in Sweden, including the Tree Hotel, the IceHotel, or the Sala Silivermine. On TripAdvisor Jumbo Stay has a score of four out of five. 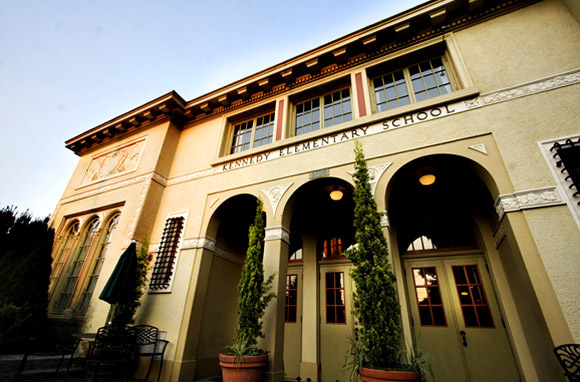 Here's the best excuse you'll ever find for falling asleep in school: an overnight stay at the McMenamins' Kennedy School in Portland, Oregon. The classrooms in this 1915 elementary-school building have been converted into guest rooms that come complete with original touches such as chalkboards and cloakrooms. The hotel also has a restaurant, bars (including the Detention Bar and the Honors Bar), its own brewery, and a movie theater in a former auditorium. Rates range from $115 to $145 per night and include access to the soaking pool and the movie theater. Pets are allowed for an additional $15 per pet per day. On TripAdvisor Kennedy School has a score of four out of five. 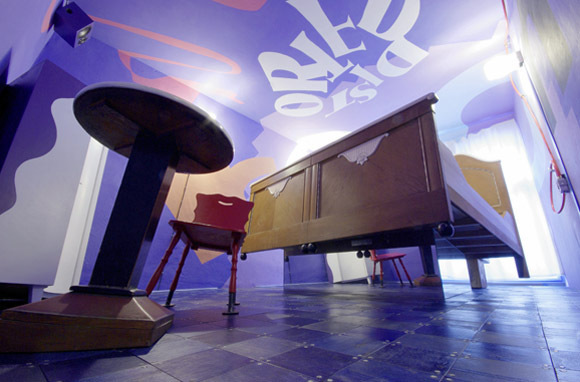 Berlin's Propeller Island City Lodge blurs the line between sleeping and waking with its unique collection of surreal environments. Each of the 30 rooms was created by German artist Lars Strochen, who considers the lodge to be less of a hotel and more a museum that gives guests the chance to stay in a work of sculpture. Choosing your particular experience is the key—would you rather spend the night in a room with a slanted floor and a bed that hovers in the air (room 11), one in which the furniture hangs from the ceiling and the guests sleep in comfort below the floorboards (room 23), or a room where guests can choose between sleeping in a coffin or in a bed tucked into a labyrinth (room 31)? Rooms rates are based on single occupancy; each additional person is 15 euros per night. Nightly rates range from about $90 to $250. On TripAdvisor Propeller Island City Lodge has a score of three-and-a-half circles out of five. Walk in the footsteps of history by calling it a night in a New Mexico cave. 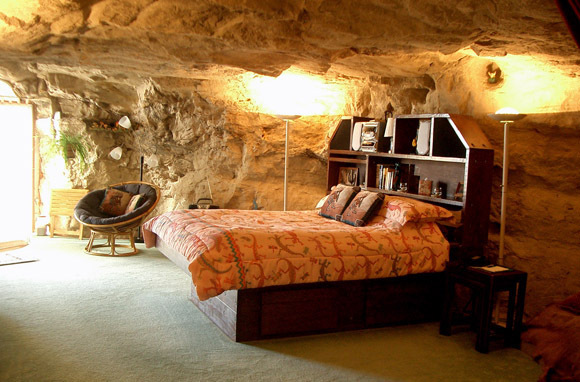 At Kokopelli's Cave Bed & Breakfast, not too far from the famed ancient cliff dwellings in Mesa Verde National Monument, you can sleep 70 feet beneath the surface in a cliffside dwelling. It may be a cave, but rustic it's not—the 1,650-square-foot space, which is accessible via a cliff-face entrance, comes complete with hot and cold running water, carpeting, a kitchen, a fireplace, and both a waterfall-style shower and a flagstone hot tub. Note that any stay requires a basic level of fitness, since getting to the cave requires traveling on rough dirt roads, a short hike down a steep path, and a climb up the entry ladder. The nightly rate is $260 for double occupancy, or $300 for up to four people. The kitchen is stocked with breakfast supplies, though due to the cave's isolated location, you'll have to make meals yourself. On TripAdvisor Kokopelli's Cave Bed & Breakfast has a score of four-and-a-half circles out of five. Tip: In a hotel made fresh each year from 15,000 tons of snow and 500 tons of ice, you don't bother asking if they can turn up the heat. At Quebec City's Hotel de Glace, or ice hotel, cold is cool. The 36 rooms and suites, plus the ice bar and ice cafe, are built anew every December and January. Overnight guests can explore the sparkling hotel, then warm up in the outdoor hot tubs and saunas, before settling in for the night in subzero sleeping bags atop mattresses perched on elaborately hewn ice beds. Rates are $219 per person per night and include a welcome cocktail, all the equipment you'll need to sleep, breakfast, and spa access. If you're curious but don't want to spend an entire chilly night, guided tours are available during the day for $17.50 for adults, $15.50 for students and seniors, and $8.75 for children. Fans of ice lodging who are willing to travel farther afield should also check out Sweden's IceHotel, the world's largest. On TripAdvisor Hotel de Glace has a score of four out of five. What a sewer. Usually, such a statement made about a hotel would be a major warning sign. But in the case of Austria's two dasparkhotel properties, it's a friendly statement of fact. 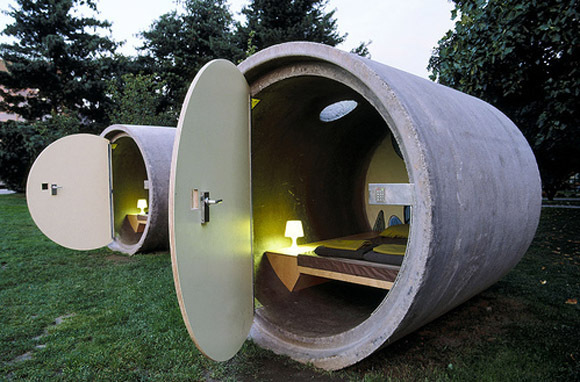 From May through October each year, dasparkhotel offers guests the chance to sleep in rather modern, sleek sections of cement drain pipe. Individual rooms are outfitted with a skylight, plus a double bed, a lamp, and storage. Bathrooms, as well as a cafe, are situated nearby. It's debatable which is the more unusual aspect of dasparkhotel: that you sleep in cement cylinder, or that rates are based on a "pay as you wish" system. That is to say, a night's stay costs as much as you can afford or want to pay to support the hotel project. In most ways, The Imperial Boat House Beach Resort in Thailand offers up a pretty standard beach getaway. The hotel has a big pool, exclusive beach access, upscale rooms, a spa, and restaurants that offer both traditional and international cuisine. But look around and you'll notice something unexpected tucked into the hotel's extensive gardens: 34 teakwood rice barges. The boats have been converted into two-story suites with sleeping and changing areas, living rooms, and large bathrooms, plus private balconies on the boats' decks. Rates vary by season, but hover around $145 per night for this November and December. 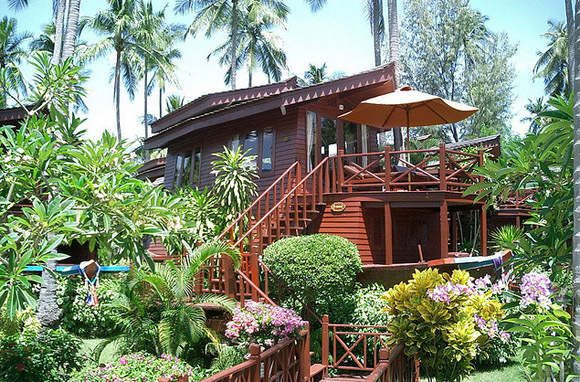 On TripAdvisor the Imperial Boat House Beach Resort has a score of four out of five. What other unusual accommodations have you heard about or stayed in during your travels?